Lake Kawakuchi (Kawaguchiko 河口湖), one of the Fuji Five Lakes. It’s a 2 hour express train out from Shinjuku in Tokyo. I rushed through this and only took a day trip, where it would’ve been better to stay a night and have 1.5-2 days. There is so much to see in the area, and it’s nice to just sit and admire Mt. Fuji. Lake Kawakuchi, Lake Motosu, Lake Sai, Lake Shoji, and Lake Yamanaka surround the Northern edge of Mount Fuji. 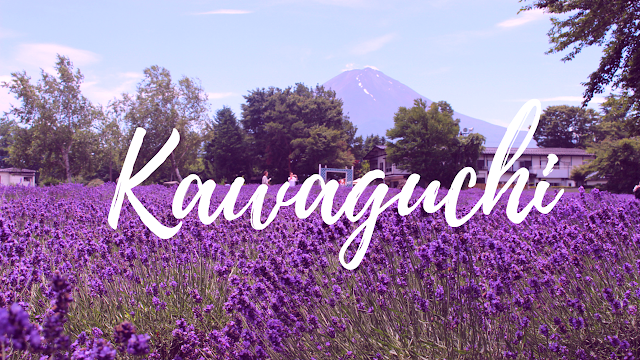 Lake Kawakuchi being the most famous one hosts a lot of cultural events and is also a major hub for Mount Fuji Climbers. 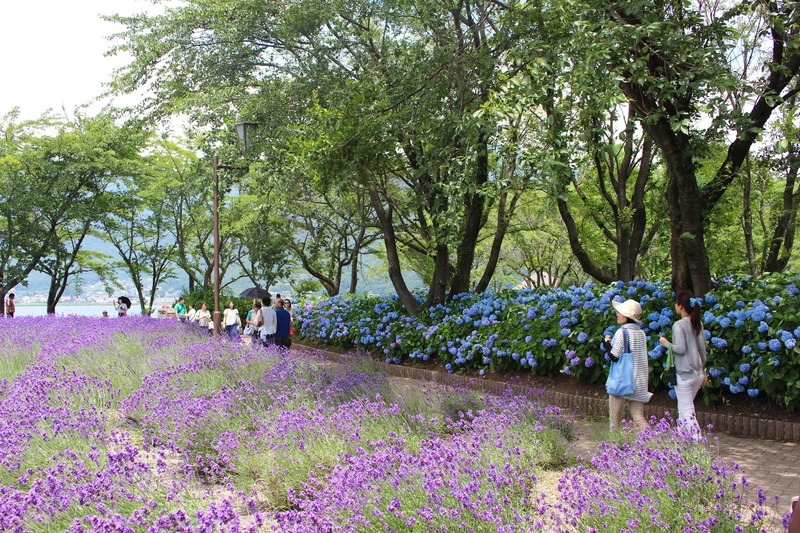 There are several parks blooming with Hydrangea and Lavender flowers in Kawakuchiko. As a part of this trip, I’m also going on the Mt. Kachi Kachi Ropeway. It takes you up Mount Tenjo for a spectacular view of Mount Fuji. Sadly I didn’t get enough time to visit Oishi Park or the Music Forest. 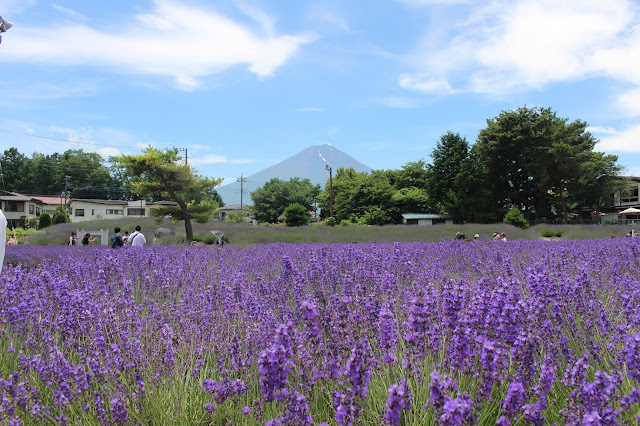 But the weather was amazing, and I was able to really admire Mount Fuji up close from Kawakuchiko. We took the Shinjuku – Kawakuchiko Rapit direct train on Saturday at 8:14 am. It took 2 hours and 15 minutes to get to Kawakuchiko. 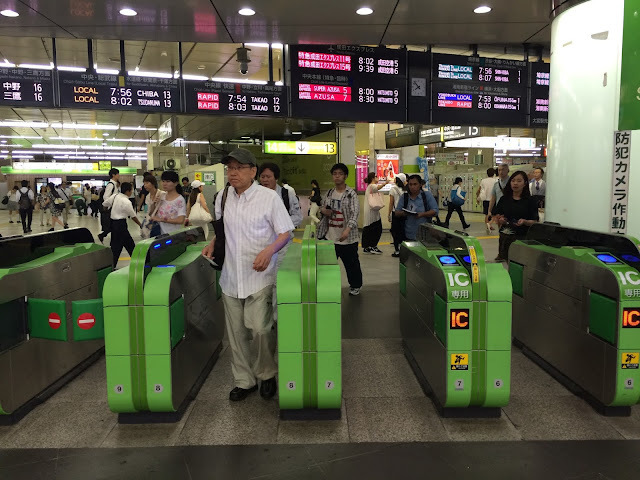 On weekends, there were several special trains leaving Shinjuku station, for example ones going to Hakone, another famous place for a Mount Fuji view. There was also another train that was really unique! I didn’t know where it was going, but in the train carriage there was a long table in the middle, one single table. Around the table were chairs to you sat facing another person and the window on the other side. You had to take off your shoes to get on the train, and the train floor was elevated so that when you sat down at the table your feet would go under it. 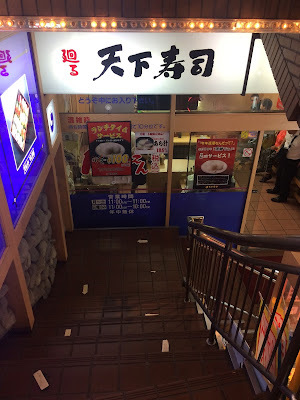 It was like a moving Japanese restaurant. Most people on that train looked like they were going for a picnic of some sort! I fell asleep quickly as soon as I got onto the train. It was going really fast until it got to Otsuki, which is around halfway point. I woke up to the beautiful country side of Japan. There were fields surround by mountains and you see houses popping up here and there. It was a very sunny day with clear skies so you can see everything far away. I know that approaching Mount Fuji from the North East side, we’d need to sit on the left side of the train carriage to get a view, and I’m so glad I was right. The view was amazing! There were some clouds on top of the Fuji that looked like a top of the mushroom. Just a few stops before Kawakuchiko, you stop at the station called Fujisan. The train enters the station then backs out so we are going backwards. We pass by Fuji-Q Highland which is the amusement park famous for its super rollercoasters and the world’s second largest haunted house. It has the world’s fastest acceleration rollercoaster with a top speed of 172km/h (I feel queasy just typing this). 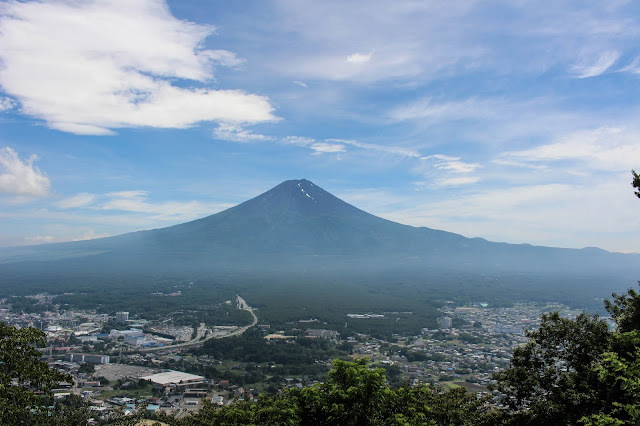 After arriving in Kawakuchiko, I’m greeted by a lot of backpackers – asleep outside on the floor that is, the exhausting toll of climbing Mount Fuji shows on their face. There’s also some hikers there to hike some of the nearby trails that can be achieved in a few hours. We were going to rent a bike, but it was just so warm and it’s hard to navigate while riding. So we decided to head for the closest park – Yagizaki Park. Saying it’s the closest, it’s still a good 20-30 minute walk from the station. It felt like 35 degrees that day and the sun was burning on my skin. We finally got to Yagizaki park, and before being able to see the park, there were some cheerful music playing. It seems to be a weekend fair where people gathered to taste the food from the local area. There was a tent with some booths, one served Lavendar Ice-cream! Just like in Furano. 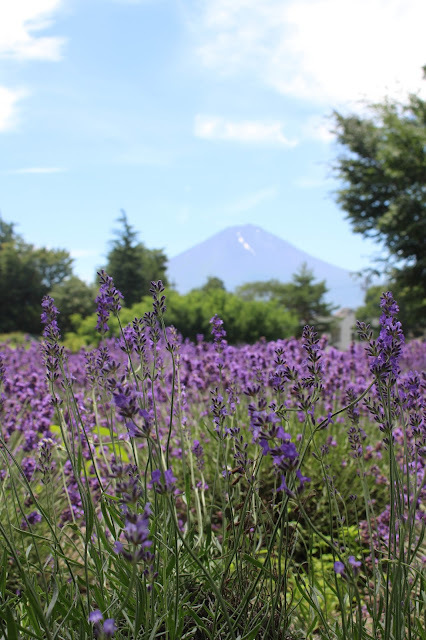 The park was filled with lavender! There was also a row of Hydrangea flowers near the shore of the lake and the Fuji just sits majestically behind the rows of lavender bushes. We somehow walked the same distance back and ended up near the Mt. Kachi Kachi Ropeway. It was almost noon time so we were wandering around, looking for lunch. There’s not that many restaurants in this area, in fact it’s just a small town! We bumped into a small tourist information center with lots of maps. There were various sizes of large rocks holding down the paper so it doesn’t fly away with the wind. An old Japanese man walked out and asked if we needed some help. I learned Japanese for 3 years in college and self-studied a lot. But I’ve been so busy with German lately, I didn’t really have the chance to use Japanese. 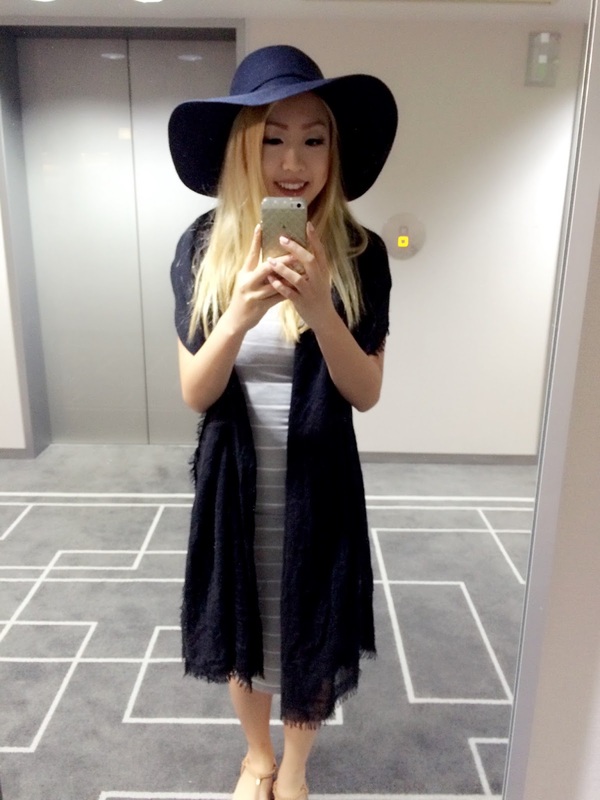 But as soon as I step foot in Japan, it all came back naturally. It just came like a natural reaction where I don’t need to think consciously about what I’m saying. My family is heavily Japanese influenced, my Great Grand Mother, Grand Father, Uncle, and a few Cousins can all speak Japanese. I guess that helps a lot! *Oyakodon is a rice bowl consists of chicken and egg. Oyako means parent and kid.. referring to chicken and egg, kind of creepy if you think about it! But it’s a very common dish in Japan and you can easily make it at home! This is a must visit if you are going to Kawakuchiko area, and I would highly recommend to buy the ropeway one way up then hike down. It’s a very easy 40 minute hike but the view is stunning. After lunch we went to Mt. Kachi Kachi Ropeway. The Rope way takes you up to around 1,000m on Mount Tenjo which sits across from Mount Fuji. Kachi-Kachi refers to the sound of fire crackling and it refers back to a folklore between a rabbit and tanuki (Japanese raccoon). We were really lucky with the line and there weren’t a lot of people. The previous car was just leaving so we were able to get into the next car first within the next few minutes. Immediately there were a long line of people behind us, a tour group perhaps. 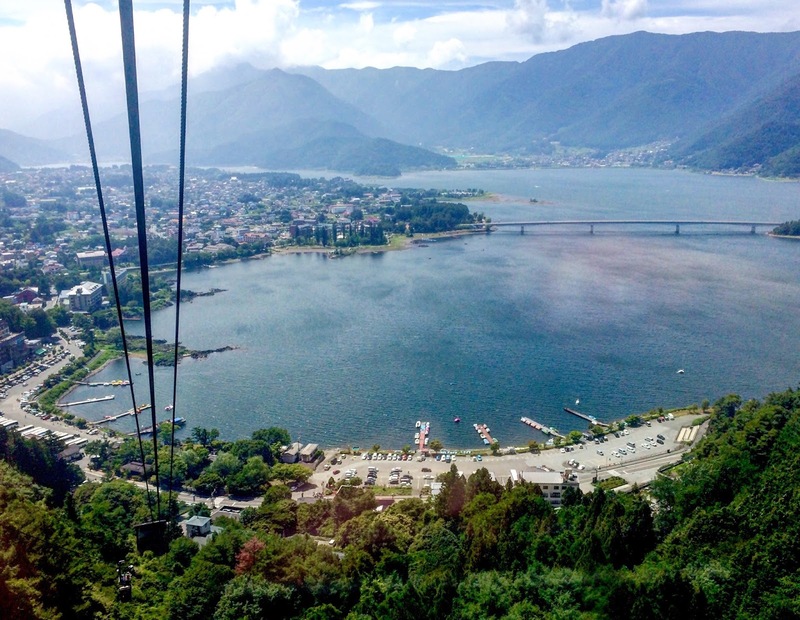 From the ropeway itself, the view of Lake Kawakuchi is amazing. It’s not until you get off the cable car and walk to the platform that you can see Mount Fuji. But the view is stunning, there is nothing blocking the view and you can see the entire city below! There’s a little café where they sell some snacks, drinks, as well as Omamori (Lucky Charms). Because there is a Usagi Shrine (Rabbit Shrine), the Omamori they sold were in rabbit shapes. I got a pink one for good luck in relationship. 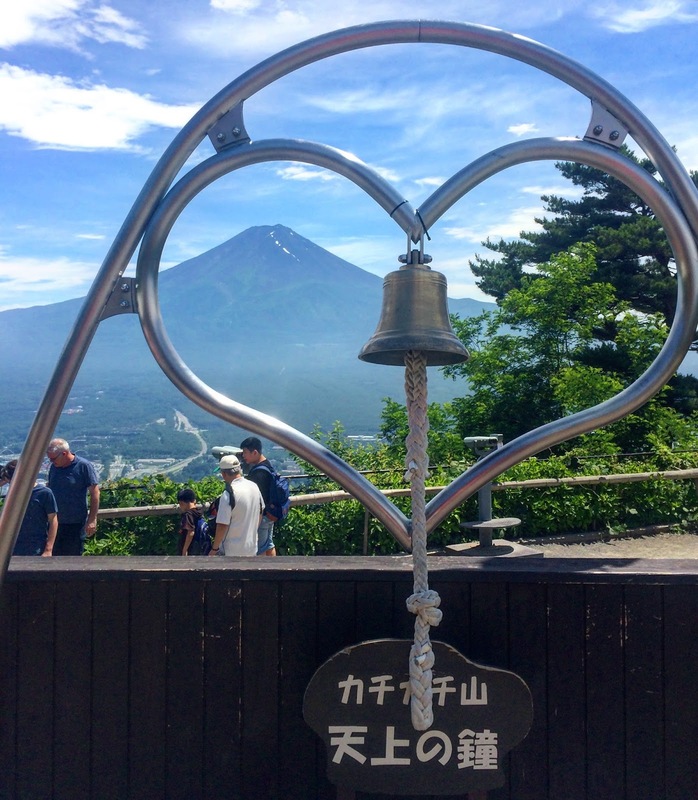 There’s also the Bell of Tenjo in a heart shape facing the Fuji. First the guy looks into the girl’s eyes and rings the bell once, then it’s the girl’s turn to ring the bell, and at the 3rd ring both ring together to pledge their love. This is so Japanese! From the platform, you can continue to climb up. After just another 15 min you reach the summit of Mt Tenjo. It’s nice and cool and the forest is denser. 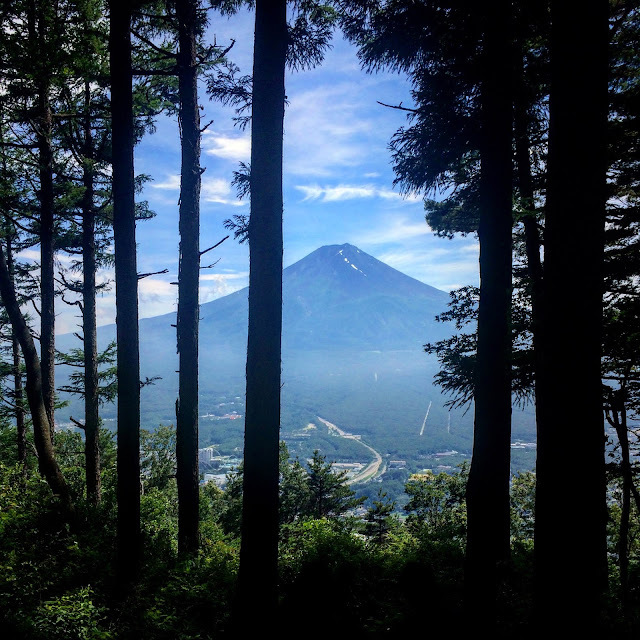 Through the trees you see Mount Fuji in the distance. It’s hard to describe the feeling but it was really calming at the same time romantic in a way. Not a lot of tourists went up there, so it was just us and 2 other people up there. We stood there for about 10 minutes just admiring the view and enjoying the calmness around us. The hike down was really simple. After having climbed Rinjani (Indonesia) this seemed like a walk in the park. It was just a 30-40 minute hike down. You walk through the forest and as you descend it gets less dense, the sun shines through, and the temperature rises. Midway there is a small monument, there you can see Fuji again, and then there is a Hydrangea garden. It’s just a 10 minute walk back to a station after that. I was really exhausted from the heat. Originally we were going to take the 5pm express train, but since we were at an awkward timing where we didn’t have enough time to go to Oishi Park and back, we decided to go back to the station to see if there is an earlier train. Turns out there are express busses back to Shinjuku! The price is about the same and it takes around the same time. Most of the busses between 4-7pm were full, but luckily we got onto the 3pm bus just in time! We stopped at the station for a quick rest, got some drinks and snacks then headed back to Shinjuku. Looking back at the pictures, it was such a good day trip. I’ve been to Japan a few times already, in fact this is my third time in Tokyo area! However each time I go I discover something new, I visit a new town. There are so many places you can travel to in Japan you’ll never get to see everything! I hope I can continue my once-per-year visit to Japan and get to know more of this lovely country.